Expertly treating each person’s head as if it was my own. The attention to detail is akin to a surgeon. Treatment is not complete until every last nit is removed from the hair. If you are curious, I will show you exactly how many bugs and eggs are coming out in the treatment. During the treatment, I will give you an assessment of how long the lice case has been active. Explanation of post-treatment plan to ensure success & prevent re-infestation. We have earned the “People Love Us On Yelp” 2017 AWARD because are a family owned business and we treat your family like our own. We go the distance to ensure that our customers are taken care of. Let us make you our next satisfied customer! As parents, we know how disruptive it can be when your family is going through a lice infestation. 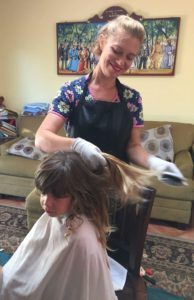 With over a decade of lice treatment experience, Organic Lice Guru is San Diego County’s safest and best choice for in-home lice removal service. While providing treatment services, I put children at ease, reassure parents and give back everyone’s sanity. As most parents will confirm, kids tend to complain profusely when a parent combs their lice out. However, in a “lice treatment” context, kids tend to sit still and relax because the person combing their lice out is not their parent or family member. Our services are backed by our 35 Day lice-free guarantee. * Expert head lice treatment at our convenient salon or right in your home. * All lice and nits are gone in One visit. * We Use all-natural products.